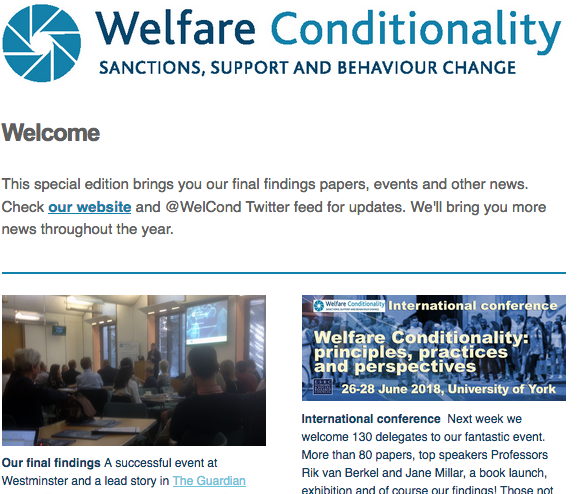 Welfare conditionality is about linking welfare rights to ‘responsible’ behaviour. A principle of conditionality holds that access to certain basic, publicly provided, welfare benefits and services should be dependent on an individual first agreeing to meet particular obligations or patterns of behaviour. It has been a key element of welfare state reform in many countries since the mid-1990s. Proponents argue this helps people transition off benefits and into paid work, but critics refute this and contend that it exacerbates social exclusion, and that experiencing benefit sanctions can push disadvantaged people’s finances into disarray. The Scottish WelCond findings report was led by Dr Sharon Wright of the University of Glasgow, and also co-authored or fed into by other academics and researchers from our six-university team funded by the Economic and Social Research Council. It draws upon three waves of repeat interviews with Universal Credit recipients, jobseekers, disabled people, migrants, lone parents, homeless people, offenders and those subject to anti-social behaviour interventions and Family Intervention Projects in Scotland. Dr Wright said: “These are exciting times for Scotland, where devolved social security is based on dignity, fairness and respect. Scottish employment services are needs-based and voluntary, provided without sanctions. Support for benefit claimants mainly consisted of mandatory self-help activities e.g. online job hunting, which few participants found useful. Responsive, holistic or in-depth support tended to be lacking. That the Scottish Parliament lobby the UK Government to transfer greater powers to Scotland, in order to promote the extension of the principles of dignity, fairness and respect within Scottish social security and employment services. To reform the currently reserved parts of the conditionality system under Universal Credit, Jobseeker’s Allowance and Employment and Support Allowance, to ensure that Jobcentre Plus users are treated with empathy and compassion, and that sanctions are reduced in length/severity and removed completely for vulnerable people. That the Scottish Government and UK DWP continue to collaborate to establish new cooperative Scotland-wide practice agreements to bridge the gap between the reserved and devolved social security and employment service systems.